Good news – the Library now subscribes to Films on Demand, the streaming video collection from Films for the Humanities & Sciences, one of the best known distributors of educational documentaries. Subjects are very wide-ranging and provide great coverage in science & technology areas, in the social sciences, and humanities. 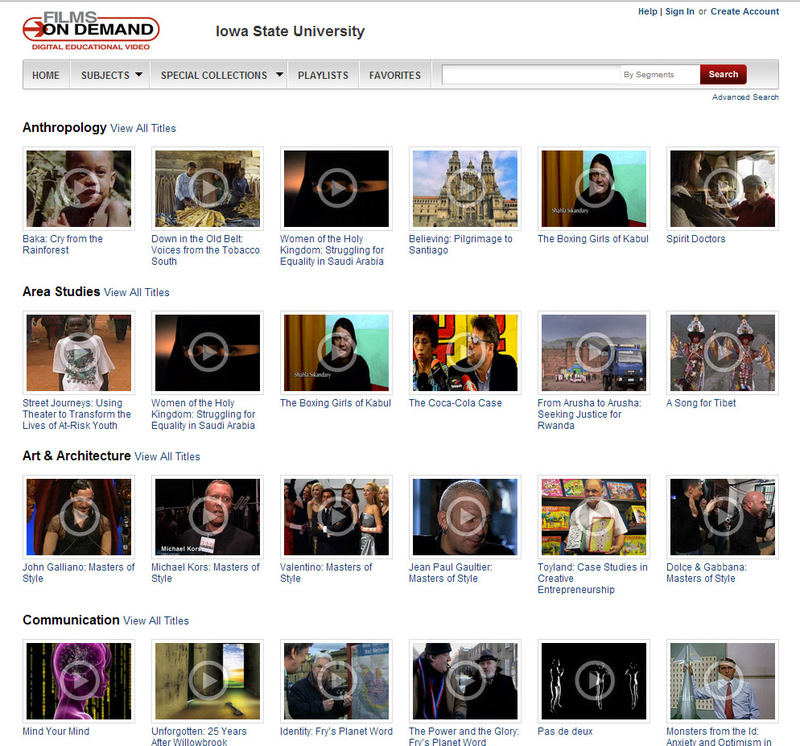 The streaming documentaries come from a variety of familiar and popular sources, including television news programs; PBS programs (such as the American Experience, Bill Moyers, NOVA, and the Ken Burns collection); TED talks, Scientific American Frontiers; California Newsreel titles focusing on African and African American topics, and more. The streaming videos in Films on Demand can be searched by title or by video segments; an Advanced Search supports searching for titles with closed-captions, interactive transcripts, and other features. Frequent users will want to create an account that allows creation of personalized playlists and organizing favorite content in customized folders, which can be a handy means for instructors to collect different materials for specific courses. Instructors can easily place entire videos or specific video segments on Course Reserve, play them in media-equipped classrooms, or stream online, making Films on Demand a flexible and engaging content tool for your face-to-face, online, and distance learning courses. (There is also an Embed feature that in theory allows you to embed the video directly in your Blackboard course pages, but…. I haven’t yet gotten this feature to work properly. Perhaps this can be straightened out soon.) Off-campus users will of course need to login with their Library Borrower ID and password to view. Pass the popcorn, and enjoy! Received the good news this morning that we now do have access to Hathi Trust! You’ll find it linked in the e-Library in the Article Indexes & Databases page. Once you click on the link, you do need to login (using your ISU Net-ID and password) in order to get fullest access to materials. I say”fullest” access by way of reminder that not everything within Hathi Trust’s collections is available full-text to all users, due to copyright restrictions. However, you will find tons of materials are now accessible to you so do login and start exploring. Here’s some info to help get you started: Items marked “Full view” are available for you to read, print, and download full-text. Items marked “Limited (search-only)” allow you to search within that item and give you a frequency number of how many times your search terms were found in the book. It will not show you the book itself to you, but does provide a helpful link to WorldCat for you to find the library nearest you that owns that item. (Why? Copyright.) Note that you can easily restrict your search results to show only “Full view” items. As you might imagine, you will find a wealth of primary historical materials are now at our fingertips. There are also lots of US state and federal government documents included, making this a good source for locating full-text of these non-copyrighted materials. One interesting item I found was the 1900 Census of Puerto Rico, taken by the US War Department just two years after the Spanish American War. 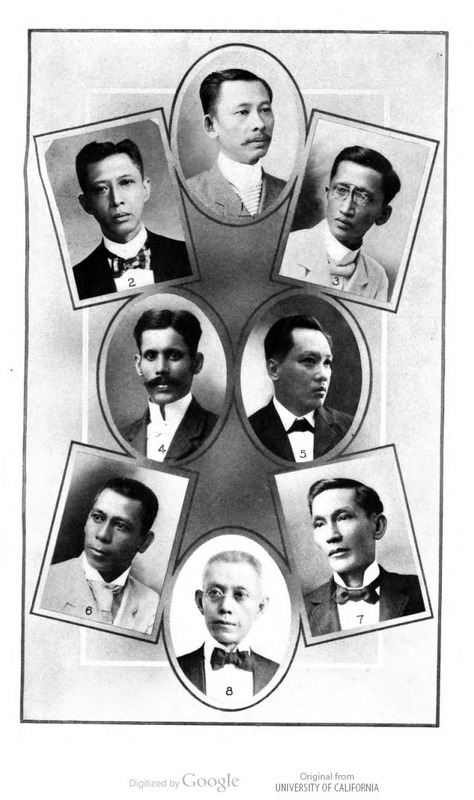 Included in the Census and its report were a number of photographs, including interesting photos of the actual folks who worked as the Census enumerators in specific cities. 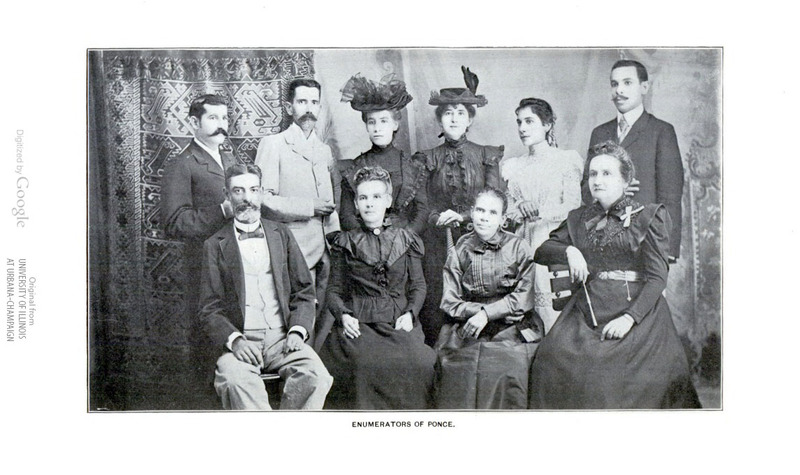 Here are the enumerators from Ponce, one of the only groups that seems to have included and employed women. Virtually all subject areas and time periods are included in Hathi Trust’s materials, as are many different languages. An Advanced Full-text Search is available, allowing you to specify where your keywords should be found (title, author, subject, publisher, series title, etc), specify year(s), language (ranging from Abkhazian to Zuni), and by original format – archive; audio (music; spoken word; cd; lp); biography; book; computer file; conference; dictionaries; electronic resource; journal; maps-atlas, mixed material; newspaper; video (dvd or vhs), visual material, and much more. Amazing! Search facets along the left side of your search results screen help you drill down by subject, author, language, place or date of publication, and more, giving you lots of control over your search results, as well as lots of opportunities for happy discoveries. Enjoy exploring! New-ish to the Library is the fascinating ACLS Humanities e-Book collection, from the American Council of Learned Societies. This impressive collection has almost 4000 full-text scholarly books across the wide gamut of the traditional humanities (history; art & architecture; film & media studies; literature & literary criticism; linguistics; music, dance, performance; philosophy; political science, religion, and even sociology, to name a few). 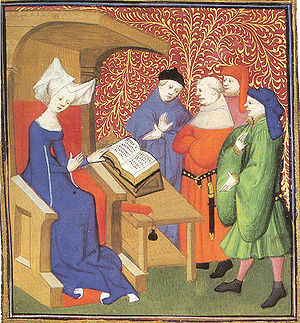 There is a strong focus on “historical studies” focused on “African, American, Asian, Comparative/World, Eastern European/Russian, Economic, European, Latin American, Legal, Medicine, Methods/Theory, Middle East, and Science/Technology.” You can download an Excel spreadsheet of the specific book titles included if you want to take a look. Okay, we know it’s huge. Even the title is a mouthful – so much so that you’ll see even the authors refer to it as ACLS HEB, or even just HEB. So what can you do with HEB? Happily, the collection boasts both an easy to use browse feature (that allows you to browse by title, author, or subject) and a very robust search engine that lets you quickly find titles / subjects / authors of interest. 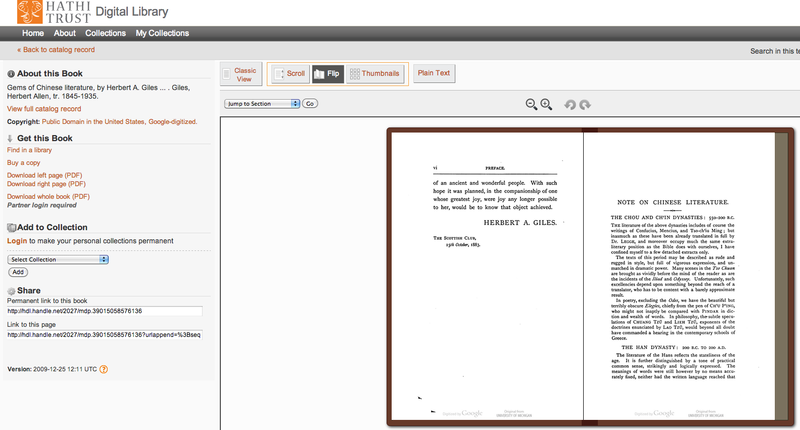 Within a few clicks, you have the full-text of the book right in front of you. Once you find a book of interest, you can enter the book from its ACLS title record page. You can go to the first page of the book and page your way through, or enter specific chapters / page ranges by using the linked Table of contents. There are book reviews for my title linked on the page, plus the full citation and full cataloging record. You can even get a larger version of the book jacket by clicking on your book’s image. I found the book, Buñuel and Mexico: The crisis of national cinema, by Ernesto R. Acevedo-Muñoz and published by the Univ of California Press in 2003. So you can see what I mean, here’s a graphic of the ACLS title page for the Buñuel cinema book I found. Once you enter the full-text of your book, you can even choose the best display – page image, text, or pdf – for your own reading comfort or downloading / printing needs. You can also easily adjust the size of the page if you need a larger font or need to see an illustration in greater detail. Speaking of illustrations, the few illustrations from book contents that I have seen have not been of the greatest quality. This is probably the only drawback I can see during my own quick review of this collection. Let me show you what I mean. Hmmmm…… in a fantastic collection like HEB, it’s disappointing to see such blurry and grainy images. This one comes from a book called Gay L.A. by Lillian Faderman. There are lots of illustrations in this interesting book and none of them seems to be scanned clearly, which is really too bad. It’s just not the same high quality images you will find in the original hardback book. I haven’t found illustrations in other HEB books yet to compare but my guess is that this may be a current weakness throughout this collection. You’ll need to see what you think. So, do use this collection to find a surprising breadth of full-text eBooks in the humanities. Don’t expect to find high quality book illustration images you can use (copyright permitting) in other projects. You will though find nice quality reproductions of book covers. And yes, you can find these books through Quick Search too. Overall, a big positive addition to the Library’s collections. Give ACLS HEB a test drive and let me know what you think! Update (1/24/13): We do now have access to Hathi Trust! You will need to login with your ISU Net-ID and password to get fullest access to materials. Remember not everything within Hathi Trust is available to all users full-text due to copyright restrictions, but you will find plenty of materials that are fully available. Have fun exploring! Looks like the Lib may soon be partnering with Hathi Trust Digital Library. If you’re not familiar with them, be sure to take a look at their site. 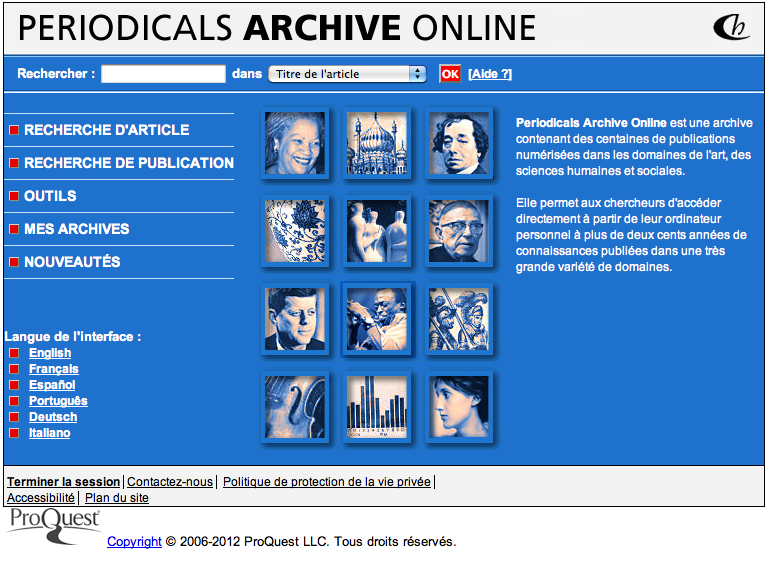 They currently have over 5 million digitized books contributed by partners. Just a few minutes ago, I was searching for a copy of Gems of Chinese Literature. Our local copy seems to be in the Storage building, but I also found a link to Hathi Trust, where there are a few editions online. I found an edition that is open to the public to view / read online. I’m going to guess you could find content in Hathi Trust relevant to all race & ethnic studies areas and much more. While some items in Hathi Trust are available to the general public to view full-text, many items are locked up. Partners are able to login and view much more. As I understand it, partnership means we would also need to contribute digital content to the site. We’ll see how things develop. This is potential great news, and hopefully everything will be ironed out for us to have access to this fantastic collection of digital books! Stay tuned…. April at ISU features a number of upcoming Lectures of interest. Roofwalker, published by Milkweed Editions, 2002. A collection of 12 short stories organized in two parts – Stories and Histories. The Grass Dancer, published by G.P. Putnam’s Sons, 1994. A collection of interwoven short stories. This collection won the prestigious PEN Literary / Ernest Hemingway Foundation Award for first fiction in 1995. 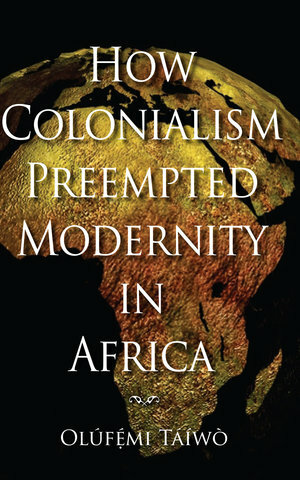 How Colonialism Preempted Modernity in Africa, published by Indiana University Press, 2010. This scholarly work examines colonialism in Africa, legal and constitutional aspects, and globalization. Faculty career paths: Multiple routes to academic success and satisfaction (with co-author Betsy E. Brown). Published by Praeger Publishers, 2006. Native American women: A biographical dictionary (with co-editor Laurie Lisa). Published by Routledge, 2001. Ethnic studies in the United States: A guide to research (with co-authors Miguel A. Carranza & Laurie Lisa). Published by Garland Pub., 1996. Help welcome these visitors and support campus programming by attending these Lectures! Update (March 1, 2013): We’ve been enjoying Filmakers Library Online for a while now. This package provides written transcripts for its documentaries, which increases accessibility and searchability. Videos include search features, plus you can easily create your own clips. Lots of other flexible features are available – please take a look and start exploring this great resource!